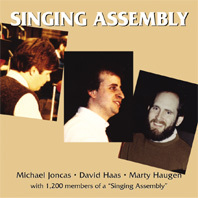 Delight in this thrilling concert featuring David Haas, Marty Haugen, Michael Joncas, Jeanne Cotter, and 1,200 pastoral musicians, recorded live at St. Barbara Church in Brookfield, Illinois, as part of the 1987 Fusion of the Arts Festival sponsored by the Music Staff of the Office of Divine Worship, Archdiocese of Chicago. This classic recording gives witness to the power of fine acoustics, superb leadership, and a singing assembly! You are the Presence (G-3506).